Hello friends! Can you believe that Christmas is just over a week away? I most certainly cannot! I wanted to share a project with you that I made to try out for the Ippity design team. We should know today who has been chosen. I used the Ippity set, Kissmas & Mistletoe. Super cute, huh? I also made a little matching tote to store these cards in. All the designer paper is Basic Grey Eskimo Kisses. I am in LOVE with this paper! It's gorgeous! The set uses Nesties Label 8. The ribbon is just from the cheapy floral area at Micheal's but I think it was perfect for crowning my sentiment. Sometimes you just need small ribbon. The Cuttlebug folder is Snowflakes. This is beautiful and love the colors and set you used. Now this is some Ippity MOJO! Good Luck! These are beautiful!!! Love the colors! Oh those are so cute Ashley! I seriously love this set!! You did an awesome job on it! I've still got my fingers crossed for you! These are so totally ADORABLE! What a great little set! What a beautiful set! Love the stamps and papers you used! What a beautiful set, love it! LOVE this! A great project! I hope you get in! This set rocks! GORGEOUS! Have a Merry Christmas and see you "next year" for the first FWF of 2010~~~! Super sweet cards, Ashley!! So pretty! pretty cards Ashley, I love that dp too!! 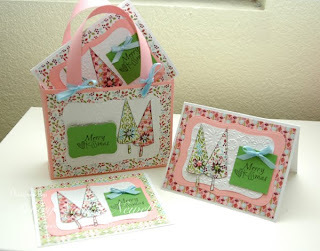 These are very pretty cards...luv your color choices and the little purse they go into! Creative and sooooo cute Ashley! Have a Merry Christmas! !